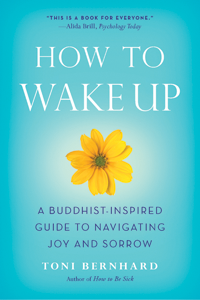 How to Wake Up: A Buddhist-Inspired Guide to Navigating Joy and Sorrow describes the Buddha’s path to peace and well-being. In my understanding, there was nothing supernatural about the Buddha’s awakening (often referred to as liberation or enlightenment). After a period of intense meditation and introspection, he “woke up” to what it means to be human—both its stark realities and the potential it holds for us to find peace and contentment. Building on that insight, the Buddha delineated a path that all of us can follow, no matter what difficulties or challenges we’re facing. This path is found in his teachings on wisdom, mindfulness, and open-heartedness—the three subjects of this book. When we’re fully present for our life as it is, whether it’s pleasant or unpleasant at the moment, we have the potential to awaken to a peace and well-being that aren't dependent on whether a particular experience is joyful or sorrowful. Embracing our life in this way is the promise of peace left to us by the Buddha. Like How to Be Sick, How to Wake Up is a practical book—full of exercises and practices, all illustrated with easy-to-relate to personal stories from my experience as a Buddhist practitioner of over twenty years. Because the book focuses on integrating the Buddha’s teachings into everyday life, it is intended for both experienced practitioners and those with no background in Buddhism. The Buddha’s teachings are not passive. They challenge us to be fully present and actively involved in our moment-to-moment experience. This opens the door to seeing for ourselves why we’re unhappy and dissatisfied so much of the time and what we might do to ease that suffering and to fulfill our potential as caring and compassionate human beings. The Buddha laid out a path for us to follow, but we have to do the work. I hope this book makes walking that path a bit easier.